These are fantastic boat, they are great as a fun boat, great as racing dinghy and great to teach in. They are such a simple design, so easy to rig and so easy to replace if.. (and this is rare) anything breaks. And for those who want advance their own topper once again it is soo easy and simple to do so, the kits are easy to fit and last a long time!! I recommend these boats to all of my junoirs in which i teach! You can pick them up for as little as £250 and range to over a grand, as well for the girlies you can get them in Pink and Purple!! I teach novices to sail at Trimpley Sailing Club twice a year. We use Toppers for the children age 10+ because they are so versatile and forgiving. I beleave that they are brilliant for novices,learners, and pro's! Toppers are a fantastic boat for learning in, as long as you're not too big! I used to love Toppers, unfortunately I'm full size, and they're not. This isn't so much of a problem if it's breezy and you can sit on the side, but our lake usually is quite not windy, and you have to crouch in the middle of the boat, and this just doesn't work when you're large. When I last sailed one at Bala and it was Force 5 it was good though. They're pretty versatile - good for kids to learn in, easy to master but as a youth development class they have a lot of potential for kids. 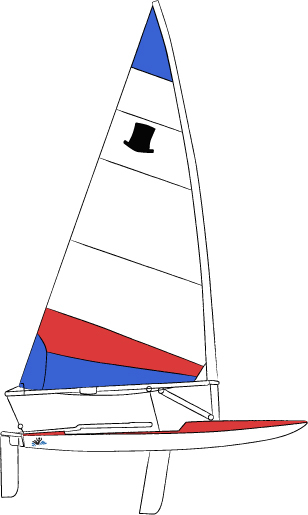 You can also change the rigging so instead of aft-main, you can rig it centre-main, using either the Topper Worlds Race Pack (about £100) or some blocks and pieces of rope (about £20). Centremain gives you a little more room in the cockpit I think.